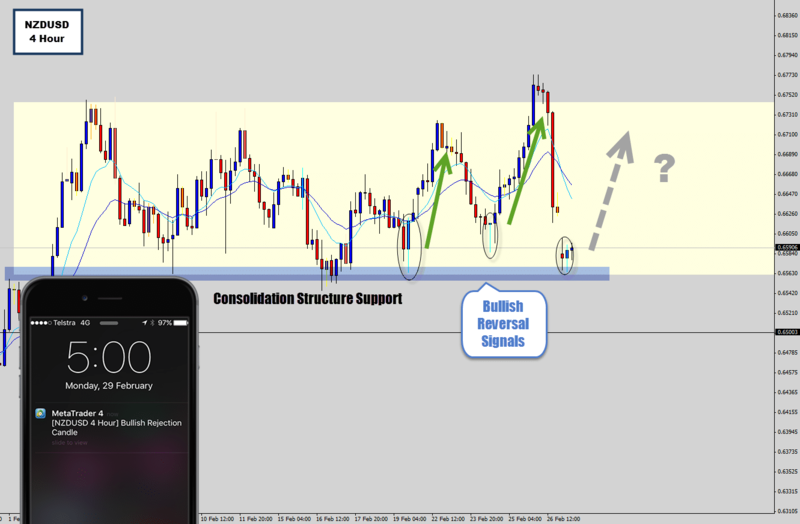 The NZDUSD has been grinding inside a Consolidation Structure, or sometimes called simply a ‘box’ here on the daily chart. I wouldn’t normally touch Price Action like this, as it looks very hostile, but there have actually been some good 4 hour bullish trade opportunities off the consolidation structure bottom support there, one of which I took last week. 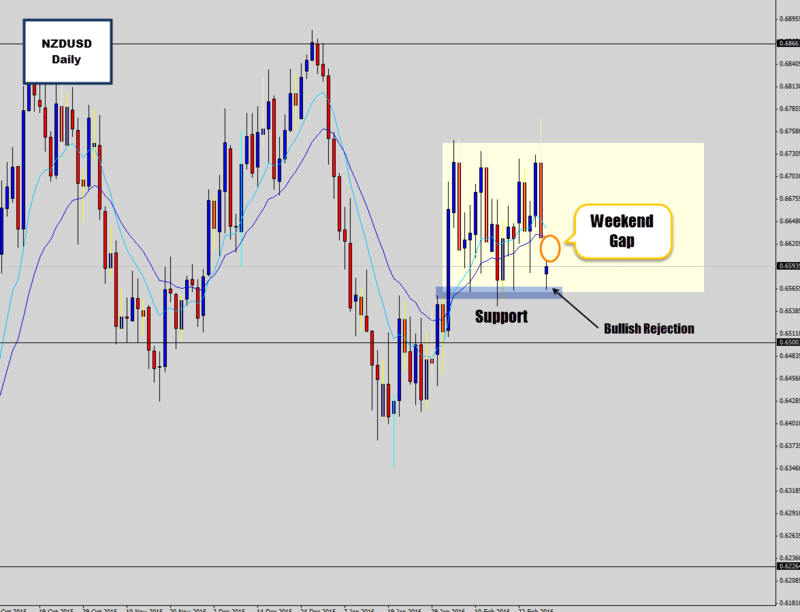 At the market open we seen the market gap down – follow through of the heavy bearish price action we seen into last week’s close. If history repeats itself here, there is an opportunity to make good return. The bullish rejection candle is small, which is the only problem I have with it, but I already made some good returns from the previous buy signal, I am willing to re invest in this signal which has a high upside potential. Lets see how this one guys, hopefully it will be a nice start to the trading week. Just a quick update on the NZDUSD situation, a large bearish reversal candle formed that the Battle Station alerted me to, that has basically created a compelling reason to exit this long trade early. The rejection candle shows the higher has failed, created a lower high, and basically itself is a sell signal. So pulling out of the long here, and jumping into a short if my retracement price is filled. 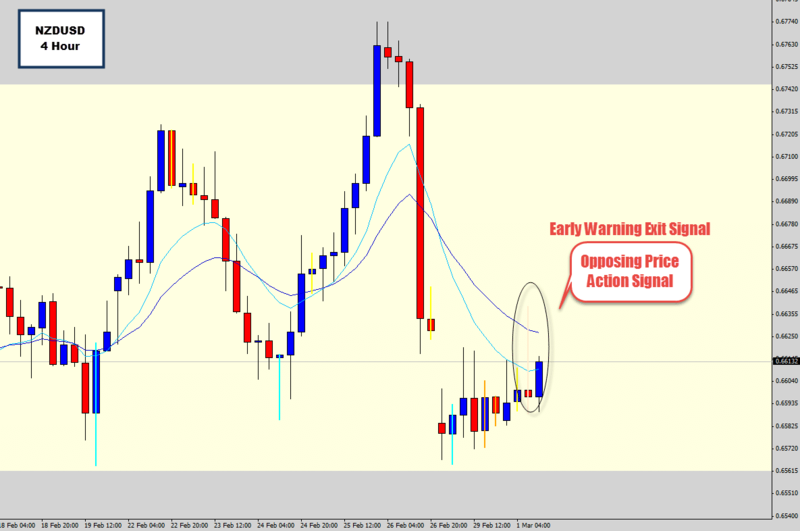 The post NZDUSD Displays Bullish Price Action At Consolidation Structure Support appeared first on The Forex Guy's Price Action Trading Strategies.